It was hard not to get caught up on the surprising photos Grandma Kono took of President Harding. 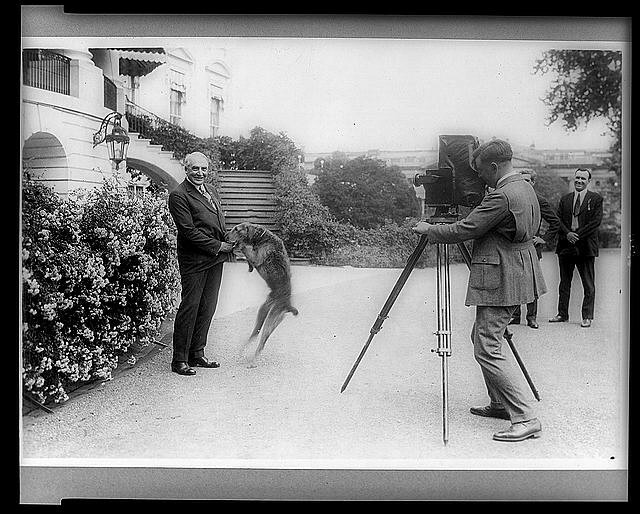 Taken in 1922 at the White House. Six days before the sudden death of President Harding. I just couldn’t deny my natural tendency to research…with no goal to speak of. And while I have hundreds of other vintage family photographs taken of up to a century ago to scan and retouch, I just had retouch President Harding’s pictures. To bring back the excitement of that warm day in Seattle. And this story is unexciting unless you are into the past…and into a family’s past as well. It was most fortunate Flickr friend, US Navy veteran and author M. Shawn Hennessy (author of “Freedom’s Fortress“) offered assistance without any prompting. What a guy…especially since he is on the mend after a bad spill on his bike. He is sure to make a lot of friends with the TSA getting through airport security now. 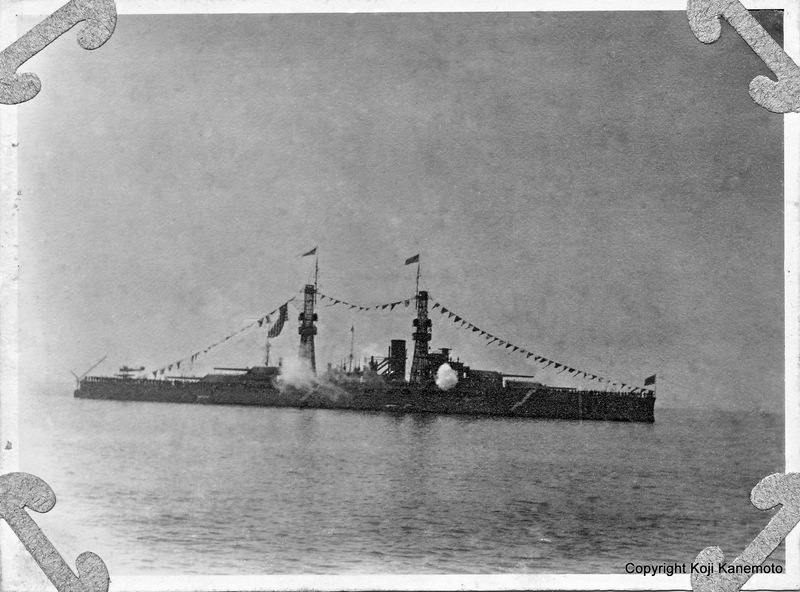 After some researching on his own, Shawn classified the battleship in Grandma Kono’s photo album as one from the Pennsylvania class. After Shawn’s assist made it easy, she was identified as BB-38 – the USS Pennsylvania. 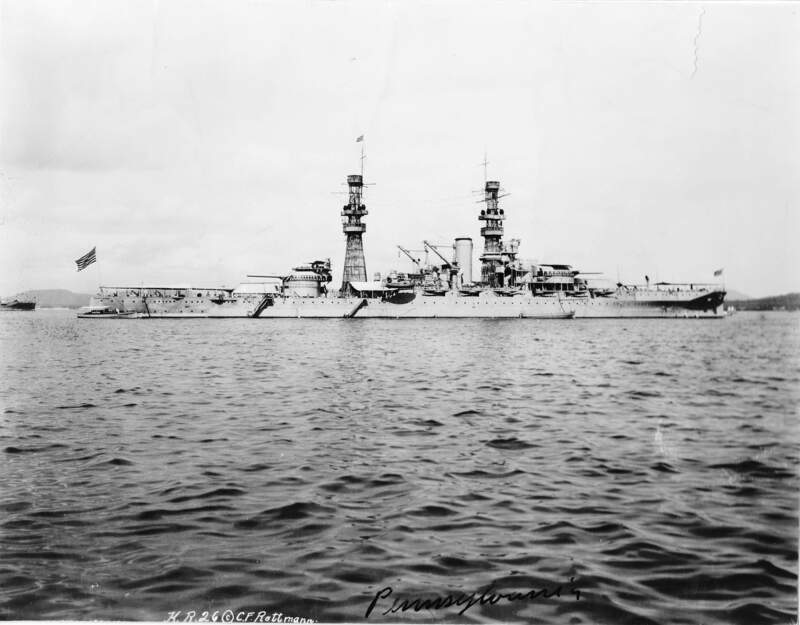 Interestingly, another battleship, the USS Idaho, was part of President Harding’s naval review – not the USS Pennsylvania. 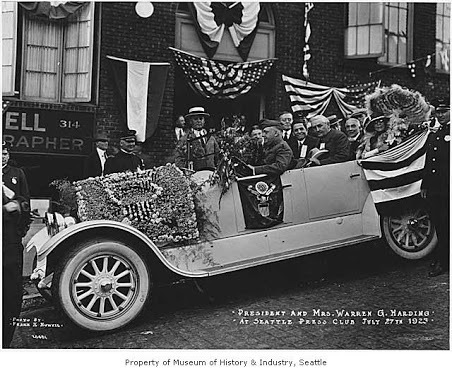 It appears that President Harding boarded the USS Pennsylvania in Puget Sound for dinner although she was a frequent visitor to that area. Her other picture of the USS Pennsylvania as retouched. The shuttle does not have a civilian standing at aft as I previously noted. We now see that he is a naval officer with his cocked hat and shoulder paulettes. 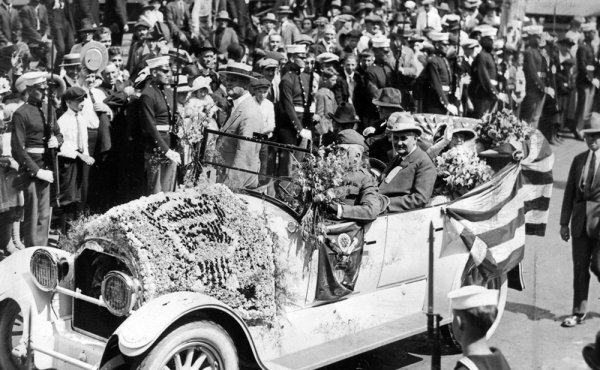 The photos in Grandma Kono’s album of President Harding’s motorcade were taken from a distance – not streetside. That would become an interesting point. 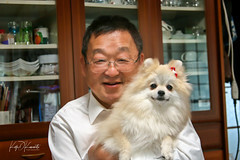 The closest view of the President in Grandma Kono’s album as retouched. Scan the bystanders. This is also a cropped image of the next photo. This is the uncropped image of the previous photo. Scan the bystanders. If you enlarge the images and scan the bystanders, I did not see one individual with a camera to his or her face. 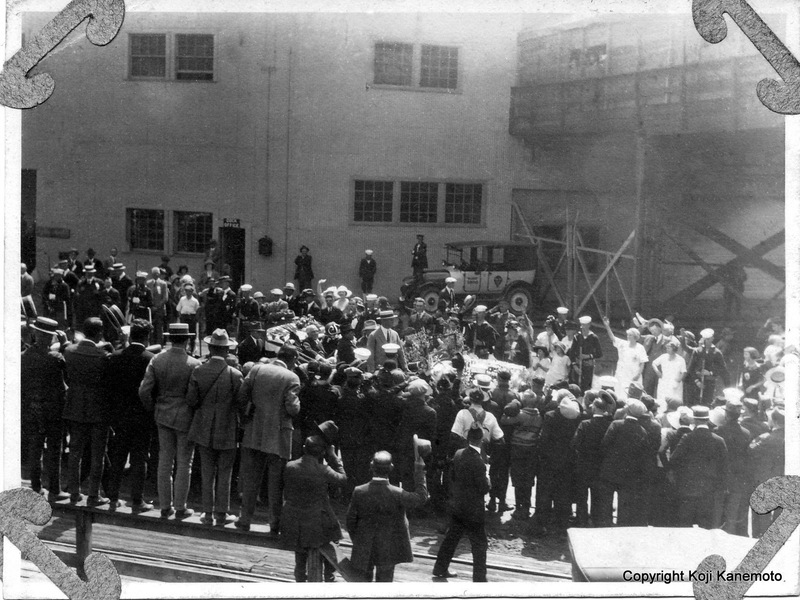 Many of the males were doffing their hat with one hand which further decreases the number of individuals capable of taking a photo. As for the cameras of that time, they would have been of the collapsible bellows type or an early Brownie – which would have been literally a box with a small hole for the lens. Both required two hands to operate properly. In the family photos while camping somewhere near Seattle, I noticed a bellows-type camera. Also important to note that is it was unlikely her camera would have been a Speed Graphic (4×5 film requires a dark slide thereby too much time) or a TLR (square negative with a reverse image in viewfinder). It would be more likely she used 620 or 127 film in my opinion. I also did not notice obvious non-whites in the crowds. The significance of seeing only Caucasian bystanders? Perhaps minorities may have decided to not be in the way…or there was no interest…or had to work as it was a Monday. That leads me to the question of whether or not my grandmother was there to snap the pictures. If not, from whom would she have received copies of these pictures? My conclusively unsupportable conclusions? That’s a sentence for sure. 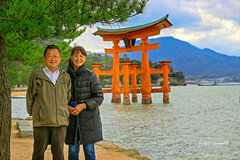 No matter how you look at Grandma Kono’s pictures, they appear to be rare, personally taken photos outside of “authorized” photographs – military, government or newspaper. They also show the “ambience” of the event being taken from a distance. I also believe Grandfather Hisakichi would have been unlikely to have snapped the photos if he were there. He was known to be strict and would have honored customs – like doffing his hat. That would remove him from have taken the pictures of the motorcade as it required two hands to operate a camera of that era. That leaves Grandma Kono – IF she was there. Lastly, I believe the film used was either 620 or 127 (or similar) and not large format. It is further supported by the print size (roughtly 2-1/2 x 3-1/2). That would tend to support the belief that the photo was taken by an ordinary bystander and not a professional photographer. It was also not taken by a Speed Graphic. Hmmm… After all this research, should I have been doing something else after all? 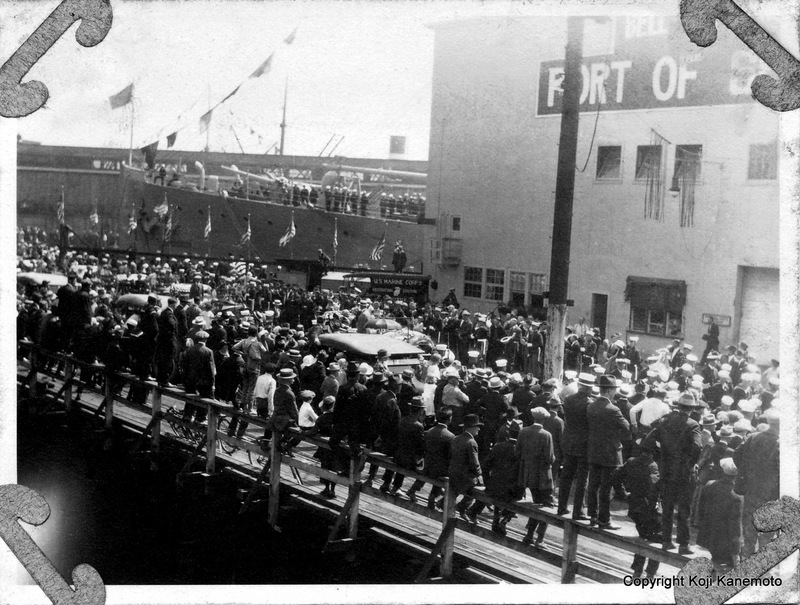 All I know for sure was that the photos of President Harding were taken on July 27, 1923 at the Bell Street Pier in Seattle. That he was already ill.
That our 29th President would be dead six days later. That I couldn’t spot any civilians snapping a picture. 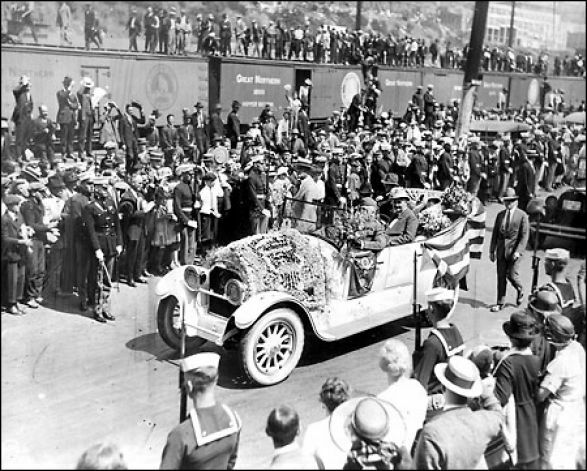 And a desire to believe my Grandma Kono took these rare pictures of President Harding. How incredibly frustrating – all that extra information and you still aren’t sure! I don’t need proof Mustang. She took them. I have the uncanny ability to believe what I want. 🙂 Great research though. I don’t understand half of (okay, more) the technical talk. I’m convinced. Back in those days who would have taken pictures and given them away? And why would your grandparents have taken them back to Japan if they had no value to them? The proof is in the way they took and kept the pictures with family treasures. Thanks, Chatter Master… but not ever truly knowing is what I am going to take to the grave with me… er, crypt… er, ocean. I appreciate that… Thank you! You’ve done some wonderful research, and it’s indeed fabulous to know that you received some help from your Fickr friend. I would go ahead and assume your grandmother took the photos, or was at least part of the witnessing crowd and perhaps had a friend who took them. It seems unlikely she’d have them otherwise, doesn’t it? I know you’ll have more questions, but it wouldn’t surprise me if over time you don’t find out a bit more. They really are a treasure! Thank you. I’m in Southern California, but glued to my radio listening to what others are experiencing! It’s really something, isn’t it? You know that I have a passion for vintage photos, especially those that are connected to my local history! It was fun to delve into the details regarding your grandmother’s images and how she captured the event and gave us a perspective that is seldom seen in the public. Instead, we see the press photos taken up close and centered on the subject hiding from view, all of the surrounding activity. The ships are always going to get my attention. It would be a fun research project to nail down that battleship’s ID by digging through the National Archives to find the ship lists for the vessels present at Harding’s visit. Yes! Wasn’t it fun??! And check out heritage_futures comments on the unretouched images on flickr. Thanks for the partnering!